We’re confident in our components and the quality of our equipment. More so, this unprecedented warranty reinforces our culture of customer support and service. 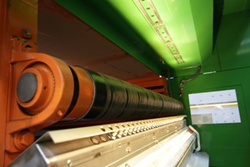 “Investing in optical sorter technology is a major commitment for our customers,” said NRT President Matthias Erdmannsdoerfer. “We want to honor this commitment by extending our warranty to the most critical components in an optical sorting unit. We see the relationship with our clients as a long-term partnership which we take very seriously. When one of these components fails there is usually a major cost associated with the repair. NRT has transferred this risk from the customer to our company, ensuring successful operations over the entire payback period and beyond. NRT offers a full-array of continuous scanning optical detectors without moving parts. In addition to exceptional recovery rates, NRT customers realize uptime benefits; unlike mirror-based scanning methods, if there is a problem with an NRT sensor, the equipment and system are able to continue operations. Covered parts include all optical-sensor related components inside the detector box, including data acquisition boards and all optics. Headquartered in Nashville, Tennessee, NRT is a leader in designing, manufacturing and installing optical sorting technology. Since our inception in 1981, our people have been industry thought-leaders and innovators. Today, we apply our technology in automated industrial inspection systems, materials handling and process control, particularly in processing material for recycling. Our team is focused on technology innovation, quality of manufacturing and a strong commitment to customer service.